In May 2009 the Macalister Demonstration Farm (MDF) made a successful application to the Department of Agriculture, Fisheries and Forestry under the Farm Ready Program for a project known as the ‘Carbon Ready Dairy Demonstration’ to identify the source and size of carbon emissions generated by normal operations and then to use this information to develop a Carbon Emissions Reduction Plan. The Plan includes strategies to minimise and offset carbon emissions as well as an analysis of the financial impact of the plan on the farm business. A key to the project is to gather and interpret information in a practical way so that farmers can then make informed decisions about their investment in carbon emissions reduction or offset. The risk involved in investing in the Carbon Farming initiative are seen as too high to be worth the investment when other lower risk actions are available. The highest priority investments, even though the emissions savings are low, are those that are the easiest and least expensive that also has milk quality benefits. Installation of a heat recovery unit on the refrigeration compressor is seen as a less expensive option to reducing water heating emissions than the more expensive warm water wash system. 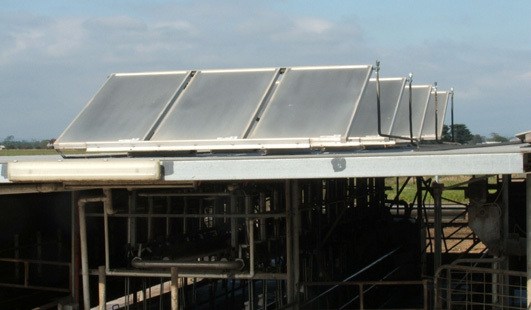 If we were building a new dairy and the price of the wash unit comes down we should consider it as an option but in an established dairy there is little incentive at the price for both the electricity cost savings and emission savings. Investment in solar hot water is recommended because it is a known technology that easily integrates into our current system. This is also an important element of this strategy – we don’t like surprises! It is a low cost investment for each tonne of emissions reduction and represents good value from an environmental point of view. One of the greatest challenges faced by all businesses is to control costs. Because renewable energy will not be subject to any carbon tax or carbon permit costs it will not be affected by any trading schemes, other than perhaps to come down in price as it becomes more mainstream. By choosing renewable energy at the time when the difference in price between renewable and non-renewable power is closer together we will effectively cap the impact of any carbon scheme on electricity costs. This generates greater financial certainty and lower risk as we move into an unknown future. This strategy achieves a total farm emission reduction of 8.45%, in excess of the national target. Whilst all of these actions reduce emissions they also generate cost savings that means that an investment in the next 18 months will have them all paid for by the 2020 target date. At this stage, any further reduction in carbon emissions come at considerably greater cost with longer payback periods. We consider it wise to wait for the development of rumen modifying actions that can reduce methane emissions and additives to urea to reduce breakdown to nitrous oxide as the next big step in emissions reduction. In the meantime, we will continue to feed our cows well and use best-management practices for fertilizer application to minimise our emissions.